It’s weird for Gaby Lewis to be the experienced one in the Ireland Women’s side. After all, she is only 17. But that role falls into perspective once you know that Lewis is 50-plus games old. In fact, she got her 50th cap for Ireland during the ICC Women’s World T20 Qualifier 2018 in the Netherlands. The teenager, whose father - Alan Lewis is a certified Irish cricket legend - grandfather and sister all played for Ireland, made her debut back in September 2014, becoming the first player born in the new millennium to represent a national team. 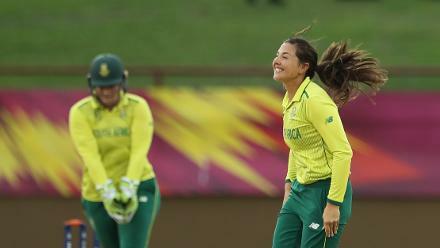 She was just 13 years and 166 days old when she took the field against South Africa. “It was kinda crazy,” she says in a chat with the ICC, about reaching the milestone 50th match. “I didn’t even realise I was anywhere near 50! But thinking back, I’ve been on a lot of tours. It’s flown by. The Ireland team is unique in that its members have a stark age gap. Girls born in the new millennium rub shoulders with experienced hands who were playing for Ireland well before they were even born. It makes for arguments over music on the team bus, but also for a warm culture of cross-generational friendship and understanding. When Lewis came into the side, she had her close friend Lucy O’Reilly, who herself had made her debut a year before at 13 years and 241 days, to lean on. Her older sister Robyn was also on many tours. So now, Lewis wants to make the new Ireland caps feel as comfortable. Ireland have had an up-and-down summer. Missing some big names, they were brushed aside by a rampaging New Zealand. Then, close to full strength, they played out a thrilling series with Bangladesh before making it four wins out of four in the Qualifier, confirming their place in this year's World T20 in the Caribbean. Lewis has been one of their constants, even making the second-highest T20I score for the country with her 61 against New Zealand. She says it was surreal performing against the likes of stars such as Suzie Bates, Sophie Devine and Amy Satterthwaite. “At first I was star struck, seeing Bates and Devine, and it hits you after a time – they’re what I want to become,” she says. This is, of course, not Lewis’ first encounter with the big names of the women’s game. Apart from the ICC Women’s World T20 games she’s been a part of, she also learnt from the likes of Satterthwaite, Lea Tahuhu, Heather Knight and Hayley Matthews during her stints in Australia’s Women’s Big Bash League with Hobart Hurricanes and Melbourne Renegades. Congrats to @IrishWomensCric for #WWT20 qualification! Well done to all involved. She’ll get another chance to do that as part of the ICC Women’s Global Development Team that will travel to England after the Qualifier to take on domestic Super League sides. All of Lewis' maturity and experience comes through when she explains what she'd like the future to look like. She wants to see the women's team become professional. "Our main goal is to go into the top eight and compete at a higher level than we are now," she says. They will get their chance this November in the West Indies. Expect Gaby Lewis to be strutting her stuff with the best of them.